The Mayan Astrology Sign Aq'ab'al is about polar opposites – dawn and dusk, hot and cold, black and white… It represents renewal, change, the end of boredom, and doing something completely different. It's about new beginnings. The Day Aq'ab'al in the Mayan Calendar: This day-sign is a good day to ask for blessings and to be pardoned for any mistakes made, even those made by accident. 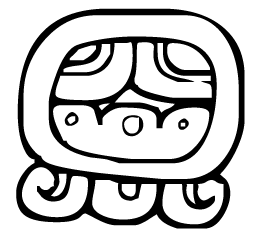 Characteristics of the Mayan Astrology Sign Aq'ab'al: You are almost always in a good mood. You have the ability to achieve the impossible. Nothing can stand in your way once you set your mind to it. You are very spiritual and giving. Others look upon you very well, with a lot of respect and admiration. You are truly a good person. You're optimistic, a great friend, and a great advice giver. You don't look your age. It's as if you're blessed with eternal youth. It's only when you're much older that you'll begin to age, and even then, it will be slow. Your privacy is very important to you. It's difficult for people to find out what you don't want them to know. You leave a lot of broken hearts in your path to find your true love. Once you decide something is over, there's no going back. This applies to all aspect of your life, not just your love life. The dual nature Aq'ab'al gives you can make it challenging for you to know which path to take in life. For everything, you see two sides. You'll spend a lot of time pondering which side is the right one for you. Sometimes looking at what's happened in the past, whether you're own or in the history books, will give you the knowledge you need to move forward. You could do well as a doctor, writer, therapist, or mathematician.